Well it’s that time of the year again! 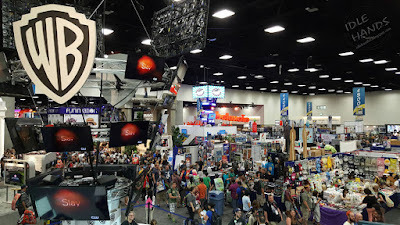 San Diego Comic-Con’s preview night kicked off this past Wednesday with the bustle and energy that we’ve come to expect. It was preview night so the crowd wasn’t overwhelming. I got in line to pick up my badge and received the standard literature with an awesome tote bag. This being my first year at the show, commonplace things like the giant Warner Bros tote bag and such were all new to me. There were different themes to all the bags but the coolest part was the flap that goes over the top of the bag. If you don’t secure the flap with the Velcro, it looks like a cape! With bags featuring the Flash or Supergirl TV logos (just to name a couple), you could express your geek loves for all of Comic-con to see. My bag contained the poster image from ‘Fantastic Beasts and Where to Find Them.’ It wasn’t exactly cape-worthy, but I still think Eddie Redmayne looks pretty heroic flapping in the wind on my back. 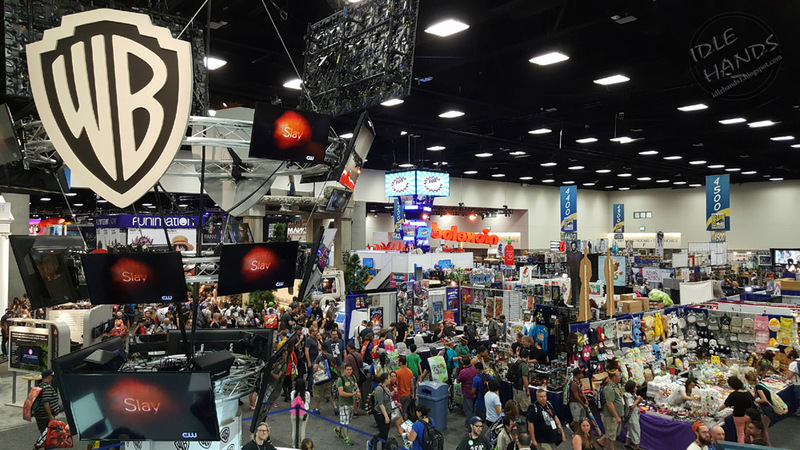 Being a shorter day than the rest of San Diego Comic-Con didn’t stop companies from coming out in full force tonight, displaying giant structures and awe inspiring statues. 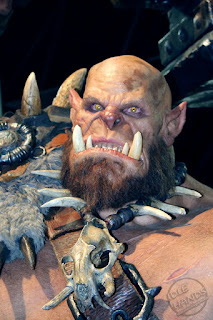 For displaying costumes and props, WETA deserves special mention! 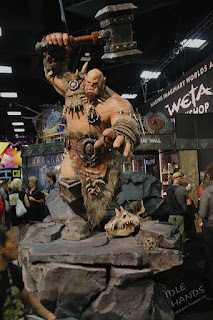 A giant orc was the centerpiece of the booth, posed bringing down a massive hammer on his piteous victim. 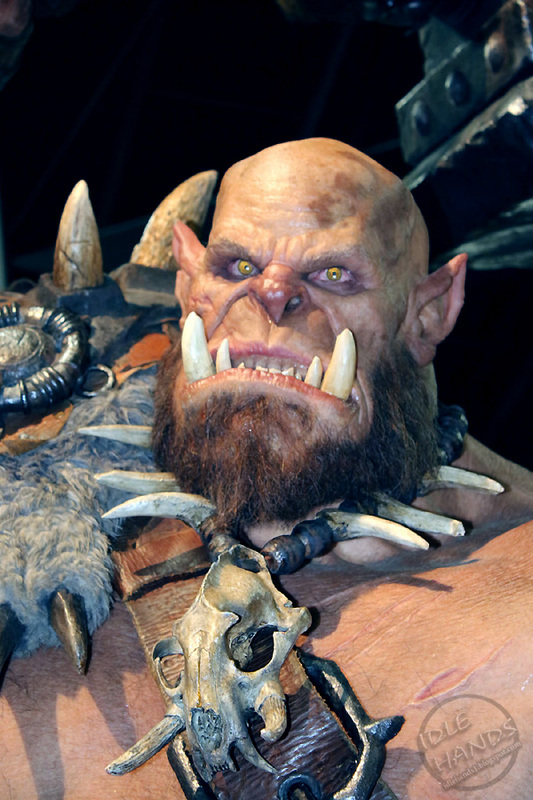 It was definitely a popular photo stop as people were constantly posing as the terrified target of the orc’s hammer. Other standouts of the booth were our first look at costumes from Ghost in the Shell, the armor from Warcraft, and many statuettes and miniatures from the Hobbit. 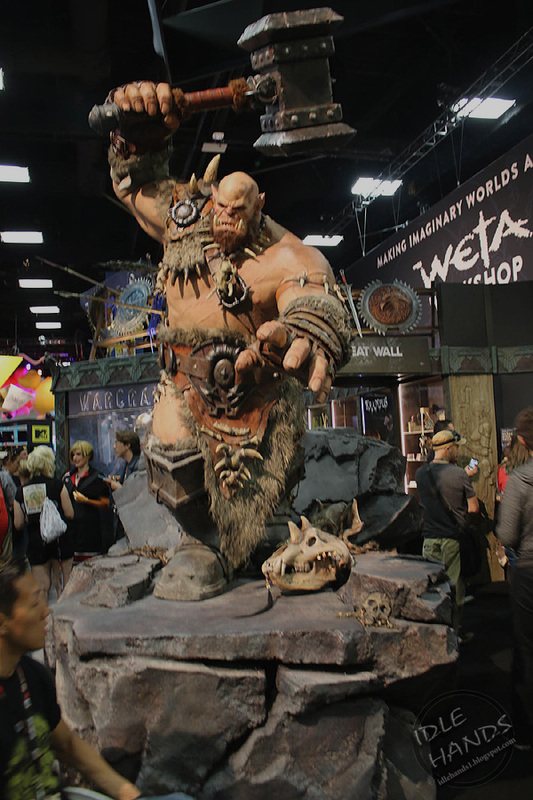 Definitely an awesome mini museum of what WETA is cooking up. 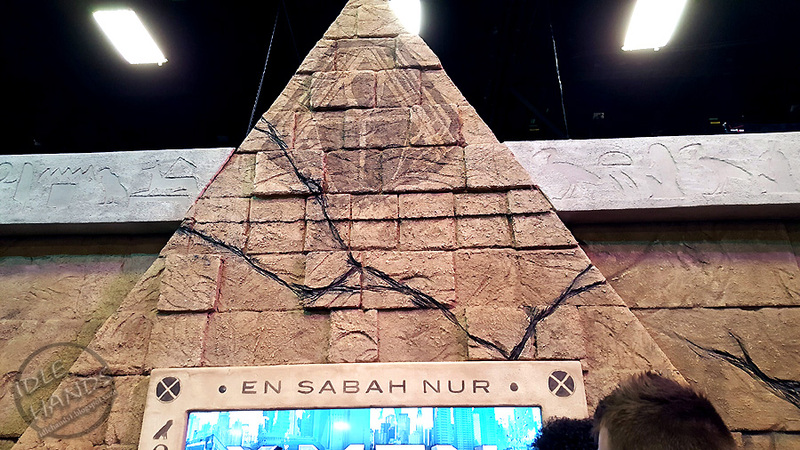 The first interactive booth I went to was for 20th Century Fox which featured an immersive experience for X-Men: Apocalypse. It was too bad they didn’t have anything about upcoming movies but what was on display was very original and extremely fun. 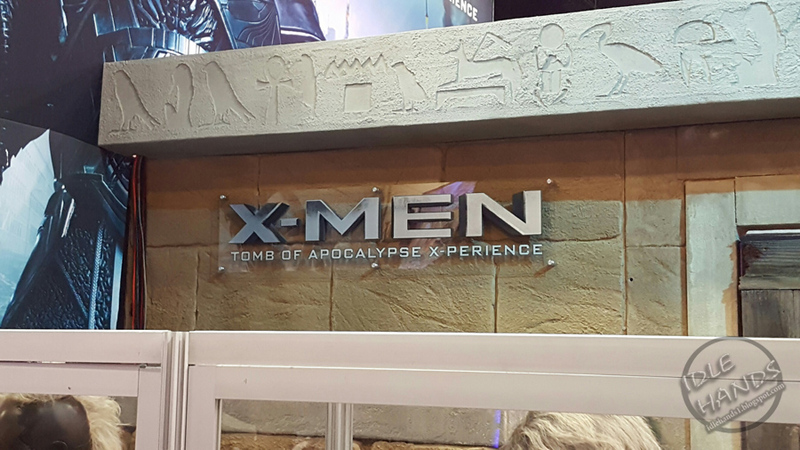 The ‘X-Men: Tomb of Apocalypse Experience’ is an escape-the-room style game where players have to solve puzzles to get multiple keys which unlock a chest. You then cover a small pyramid on the ground before a light representing the moon hit said pyramid. Sure, sounds simple! The group was split up into teams using unique tools to solve the puzzles. We were Team Magneto, utilizing an extendable magnet to fish out a key from a structure that can be best described as wooden wreckage. At first, the challenge seemed straightforward, as we were able to snag the key on the magnet fairly quickly. We tried to get it out of the same hole that the magnet stick was inserted into but the key had a wooden block attached to it that made it impossible to take out. I spent way too much time trying to get the key out as the other teams seemed to be breezing through their tasks. The hosts saw that my method of trying the same thing over and over and expecting a different result was not working so they verbally hinted that the key comes out of a different hole. It was then that I noticed there was a rope at the top of the structure. I pulled it ...but then the rope got stuck. It was attached to a hook. (groan) The puzzle finally clicked. I put the key that was attached to the magnet on the hook, then pulled the rope to a different opening while my girlfriend used the magnet to grab the key. 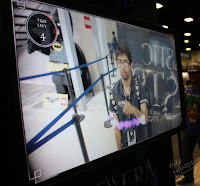 ...You know, for a silly X-Men game at comic con, this was all pretty tense!! I noticed we were the last to finish our challenge and the moon was getting ever closer to the pyramid, but our group was able to use all the keys to open the chest! And what magical item lay in wait for us to stop an entire moon from touching a pyramid??!! It was a cloth. 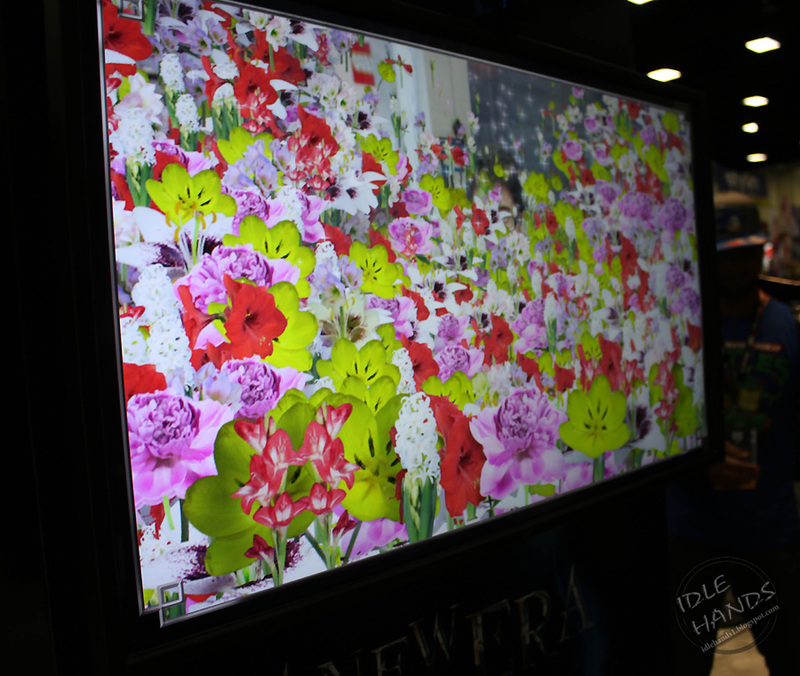 Not even a golden fleece or amazing technicolor dream fabric. Just...a cloth. The fabled dish rag of antioch I suppose. 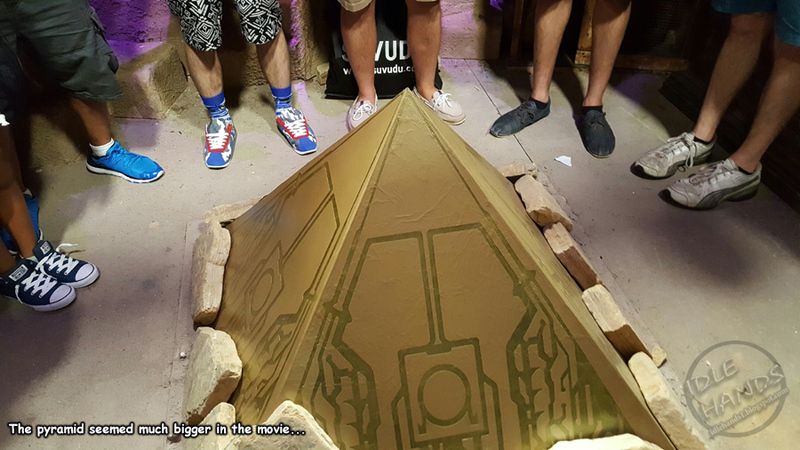 We were instructed to cover the pyramid with that to complete the game. Woooo...anticlimactic. 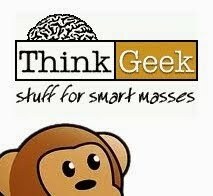 In future challenges I suppose we’d have to solve complex mathematical equations to unlock a feather duster which we use to furiously clean the legendary Hummel statues of infinity. Still, I have to say this was a great experience. It was really fun and kept everyone engaged as you are forced to work with strangers toward a common goal. This is advertising done right. I would love to see more of this in the future, though I hope I do better and everyone isn’t waiting on me to finish. The ABC booth was up next and their set design was quite impressive. 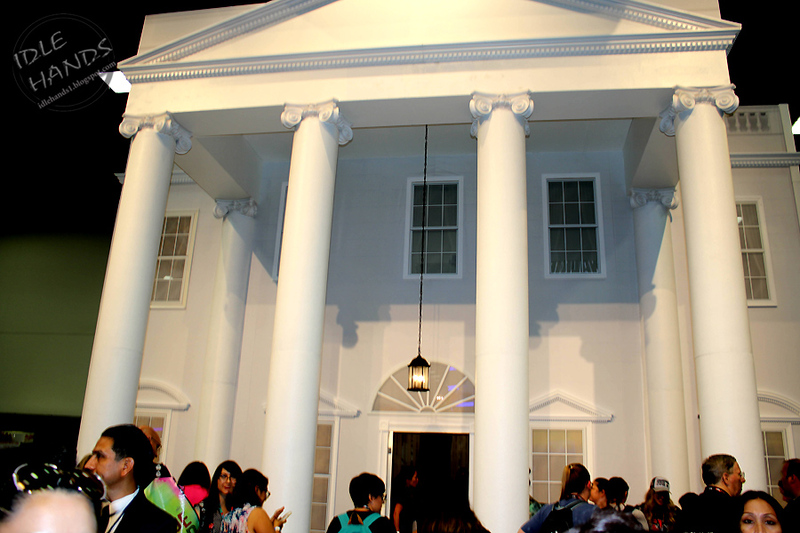 They had built a small White House with an Oval Office inside. It wasn’t extremely accurate as the chair was wooden instead of swivel and the desk was generic looking with a light oak color, but it was the Oval Office in spirit. As the rest of the crowd shuffled into the small presidential room, we were given large wireless headsets with bright blue lights over the ears. I can see it being useful when it gets too loud but it was relatively quiet and everyone looked a bit ridiculous wearing giant headsets just to watch a flat screen TV. 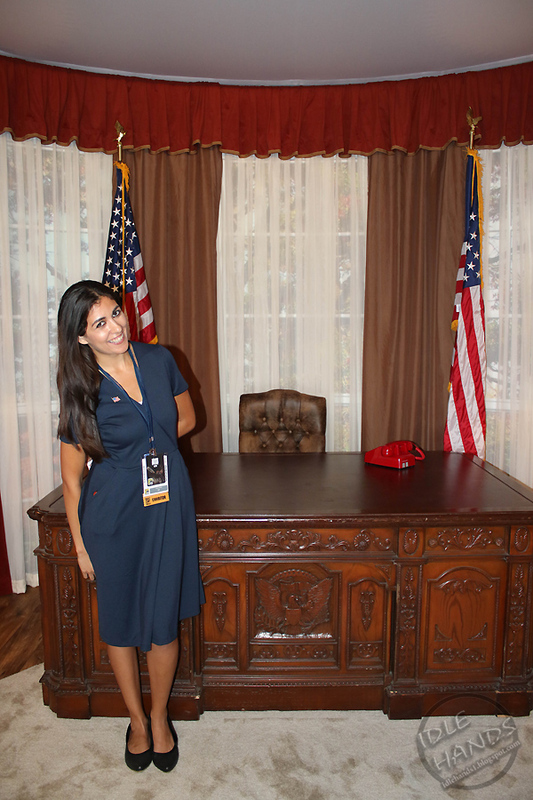 An actress dressed as a Secret Service agent showed up on the screen and explained that we were chosen to view a sneak peek of top secret information and added some attempted humor addressing the Comic-Con going stereotype. 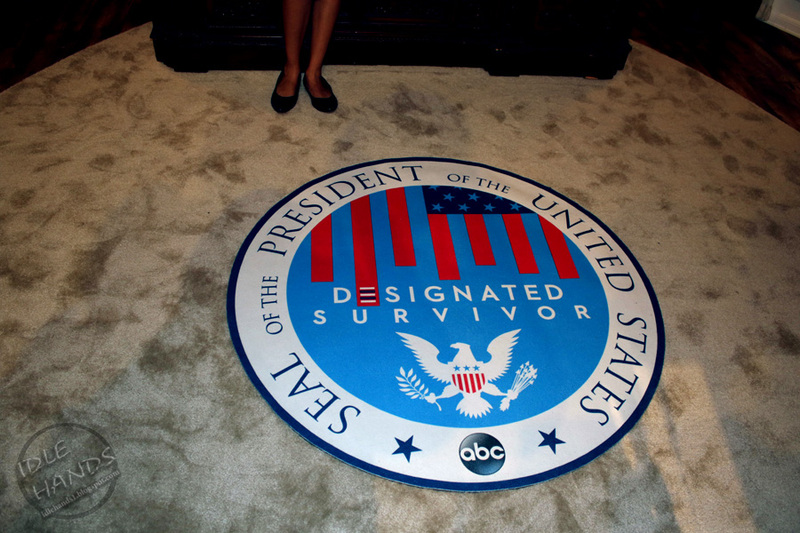 After that awkward introduction, footage was shown for ABC’s new show ‘Designated Survivor’ starring Kiefer Sutherland. The tone of the show was quite serious and dire which made the humorous introduction even more awkward. The premise is the President and all of Congress is destroyed in an explosion and the designated survivor, who is at an undisclosed location at the time, becomes President during the chaos. Kiefer’s character and the premise of the show is very similar in tone to 24. It will be fun to see Kiefer back in a political thriller on television this September! After that presentation, we returned our gargantuan, glowing headsets and explored the halls. 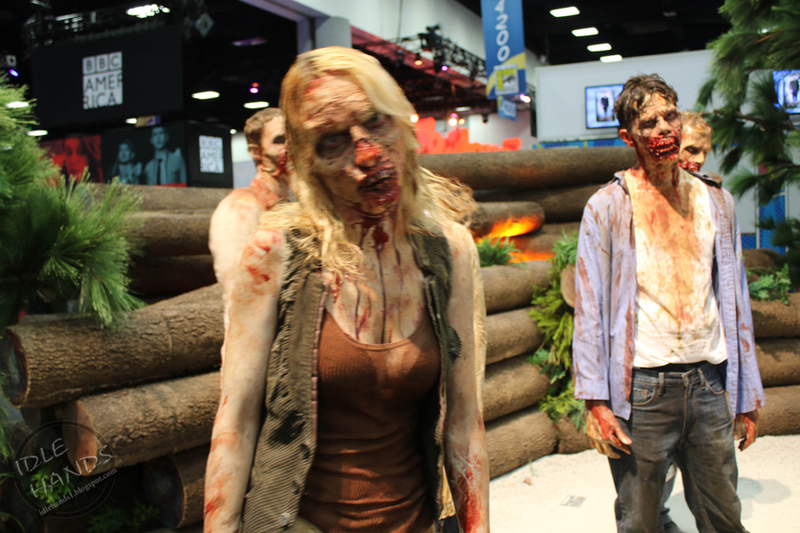 At the ‘Walking Dead’ booth, we got close to some very realistic looking zombies. You have to admire the dedication of the actors who stay in zombie character while all the bustle of the con happens around them. There were about 5 zombies shuffling about in an area next to a camper trailer. 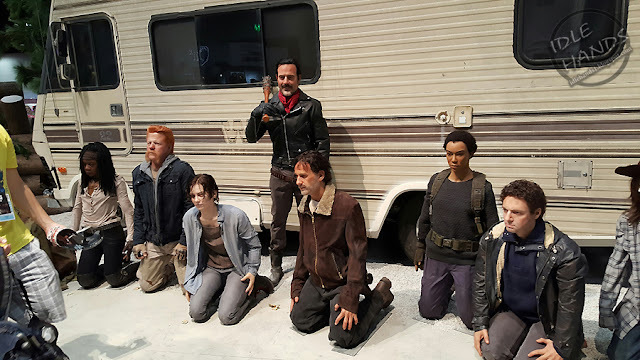 In front of the trailer there were some wax statues of all the main characters. 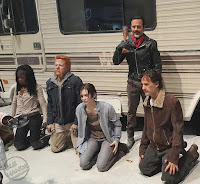 The scene recreated the final moments of the season finale with our heroes awaiting their fate as Jeffrey Dean Morgan’s character Negan smiles ominously, carrying a baseball bat wrapped in barbed wire over his shoulder. The wax statues were so lifelike it was uncanny. 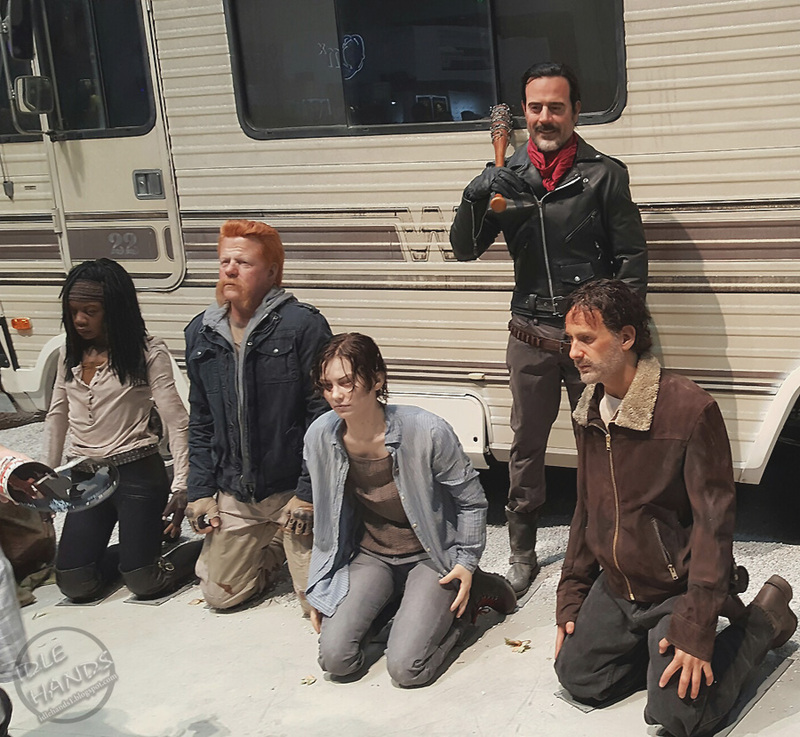 Visually, it was a very striking set recreation and great for providing fans a photo opportunity with their favorite character or if you’d prefer to be on the verge of being voraciously eaten by Walkers, you had that option! Next to the ‘Walking Dead’ area was the ‘Fear the Walking Dead’ booth. This area also included zombies but the setting was a section inside of a plane. 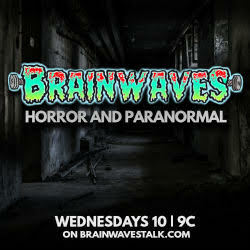 Fans were invited to sit in a plane seat and when someone attempts to take a picture or video, the zombie actors hidden in the back seats pop out and lunge at the poor victims. 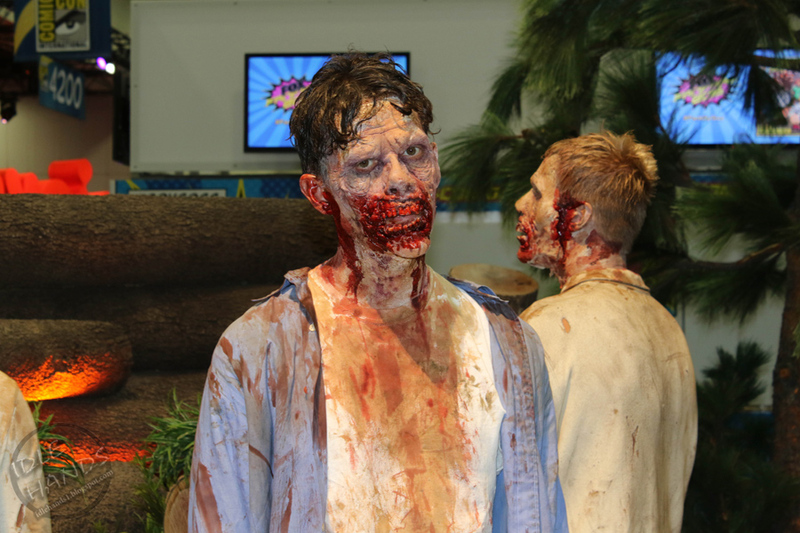 It all makes for a potentially hysterical photo opportunity to, again, get murdered by zombies, which may be the #1 free thing to do at San Diego Comic-Con. Before long, the clock struck 9 and the announcer declared the Exhibit Hall was closed. We shuffled out of the hall and into the shuttle past an incomprehensible line of people waiting for Hall H, for the following day! 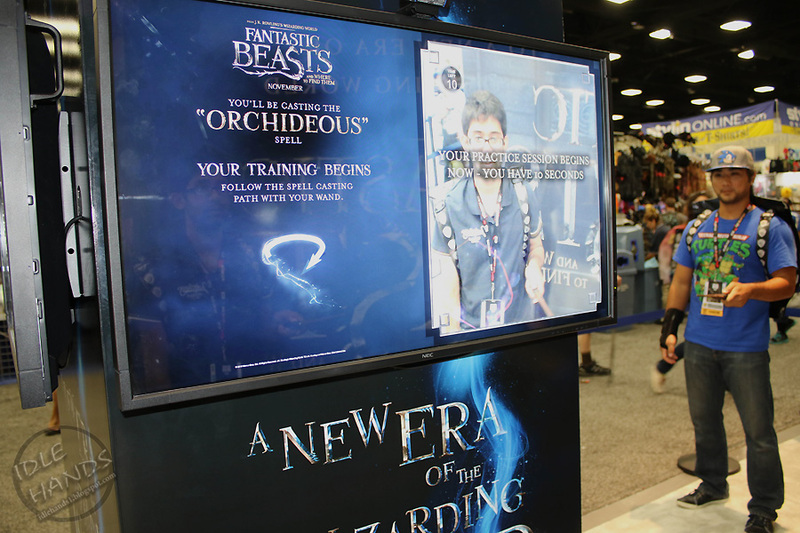 It made me ponder what Comic-Con is really about. The dedication and physical sacrifice the attendees display still amazes me. 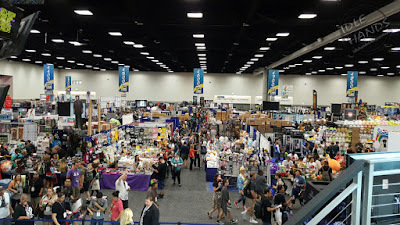 With the insane amount of hard work people put into their costumes, the hours and hours they wait in line, the amount of walking they do and they amount of money some people spend, Comic-Con has become its own culture, its own religion. My night came to a close and with images of orcs and zombies dancing in my mind. I excitedly went home knowing I get to do this again on Friday! 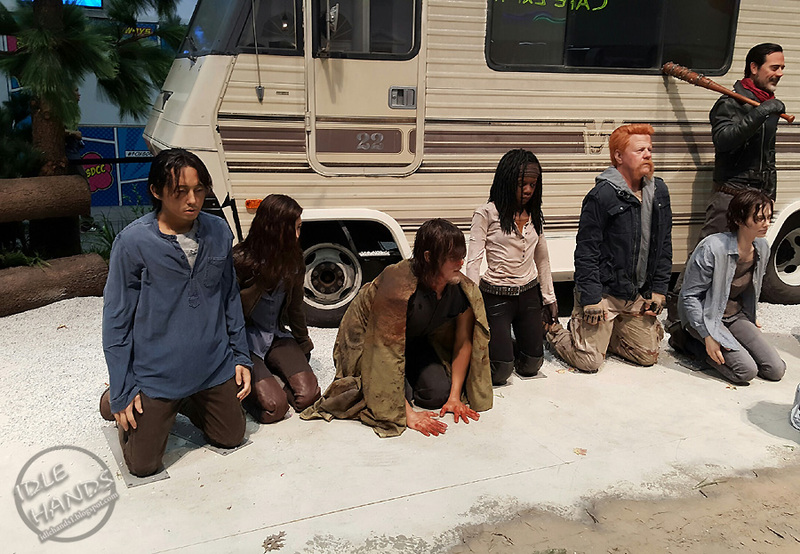 Head HERE for our San Diego Comic-Con 2016 Picture Galleries!